Graphene, the world’s strongest, thinnest and most conductive material, is expected to revolutionise products of the future. From ultra-fast transistors, to better medical imaging, or even as a replacement for silicon in computers, Aravind’s work to promote the importance of graphene to school children and adults helps place Manchester at the forefront of this internationally important innovation, and encourages more people to choose careers which support its development here in the UK. The University of Manchester is building the £61m National Graphene Institute, which will see scientists working alongside industry to help develop future applications. 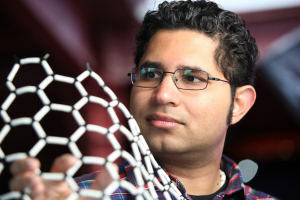 Aravind uses simple hands-on activities, games, models and videos to explain how Nobel-Prize-winning laureates Professor Andre Geim and Professor Kostya Novoselov first managed to isolate the single atomic layers of graphite – known as graphene. Aravind is working to develop a visually engaging project for the Festival that aims to inspire visitors about the unique and beautiful structures of graphene and other polymers. The award, which includes a prize of up to £1000 to spend on a project and a one-off trophy, aims to encourage science communicators in the early stages of their careers to come up with imaginative ideas which inspire people of all ages about science. Previous winners for the Josh Award including Steve Cross from UCL, instigator of Bright Club and Science Showoff and Stand-Up Mathematician Matt Parker, who recently did the biggest calculation ever attempted on a computer made entirely of dominoes, at MOSI. Manchester Science Festival is an annual nine day celebration of science and invites people to play, create and experiment with science through beautiful installations, immersive science experiences and more. Manchester Science Festival is proudly produced by MOSI. The Josh Award is named after the late Joshua Phillips, who was a science communicator at MOSI. MOSI is part of the Science Museum Group, a family of museums which also includes the Science Museum in London and Wroughton, near Swindon; the National Railway Museum in York and Shildon; and the National Media Museum in Bradford. They are all dedicated to offering life enhancing visitor experiences and hold world class collections in the fields of science, engineering and technology.